Tesla’s truck is a departure from more traditional diesel-powered equivalents in a number of ways, but it might be most starkly different when it comes to the cabin. 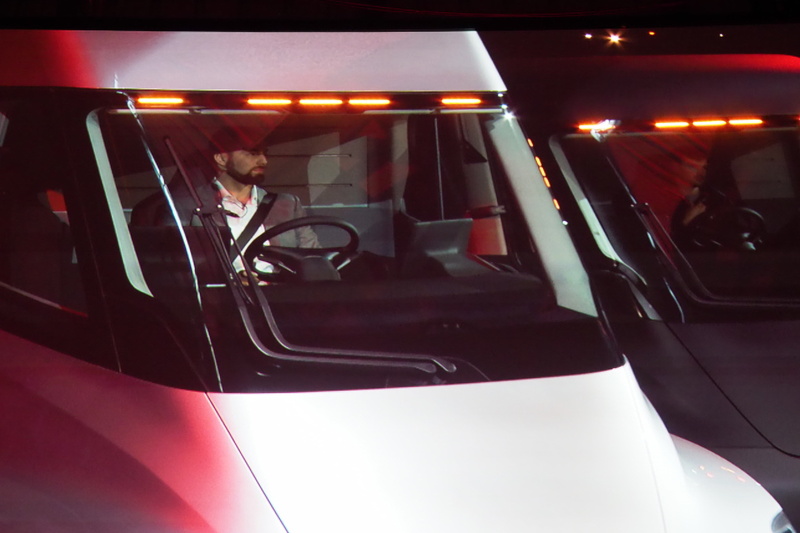 I got the chance to spend some time in and around the Tesla Semi, and it’s going to offer up a dramatically different experience for drivers once they get the chance to hit the road. The truck cab itself is obviously very different from the outside, with sleek lines that have more in common with Tesla’s consumer cars than with other transport vehicles. But the sleek lines and minimalist approach to seams and exterior breaks is only part of the story – inside, there’s a whole lot that you wouldn’t expect, too. This starts with getting into the cab, which you do using a set of stairs that are built into the truck’s side and that extend nearly all the way to the ground. It’s a lot easier than getting in and out of a traditional semi truck cab, for sure. It feels more like getting into an expensive consumer highway coach bus, in fact. Once inside the cab, I was started to find that even at 6’2″, I could easily stand with clearance left to spare above. There’ plenty of space in general in the cab, all around, even with the secondary jump seat installed (and it can be removed). The center-positioned driver seat takes up the most space of any cabin accoutrement. That center seat is unusual, since most driver seats in existing vehicles are obviously offset to the left. But it’s also set more forward than on most trucks, since there’s no motor to fight for space with. The dash is also more minimal than most, with two touchscreen displays on either side of the wheel (these are the same units used in the Model 3, by the way). The touchscreen display navigation information, as well as cabin controls, and multimedia. I was easily giving songs thumbs up and then quickly shifting over to the Autopilot controls on the left console, which would’ve allowed me to do things like engage lane keeping if it was actually on the road and driving. The central position is designed to give you a bit of a “king of the road” feel, according to Tesla, and it does indeed convey that. It helps that you’re surrounded by a nearly panoramic set of three windows, including the windshield, that provide a much more unobstructed view of the road then you’ll normally get from a truck cab. 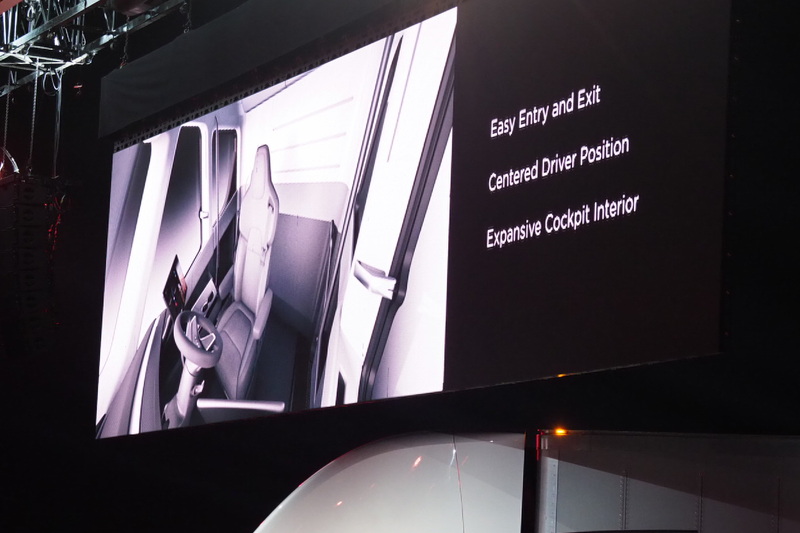 There also weren’t any wing mirrors on the Tesla Semi I sat in, which Tesla explained is just a conceptual vision of how it might be able to outfit the truck in future, when laws recognize that you could replace much of the functionality, if not do more, with cameras vs. physical mirrors. The cab also featured plenty of storage, in the doors, above the rear wall (like airplane overheads) and with cupholders. Tesla says it’s designed to be convenient for the use habits of existing drivers, who tend to bring a lot of stuff on the road. In the end, the Tesla Semi feels more like a car than any other transport truck I’ve had the chance to get into before. It lacks any shifters and seems a lot simpler to operate, too. It feels a little bit like you’re the captain of a futuristic space ship when you’re plunked in that central driver seat (which is also hydraulic for added comfort). I can definitely see a lot of truck drivers angling for a chance to pilot this once it becomes available.